When it comes to Toyota Soarers, it’s strange that the model with the biggest capacity engine is so frequently overlooked. When most performance enthusiasts have the choice between a 4.0 litre V8 Soarer or a twin-turbo 2.5 version, they invariably pick the boosted option – and then proceed to boost it further. But what happens when you combine big-cube V8 beef with boost? Peter Taplin’s 1991 Soarer V8 has all the laid-back grunt of the magnificent Toyota quad-cam V8 together with the performance sting of an aftermarket supercharger installation. It’s the best of both worlds. 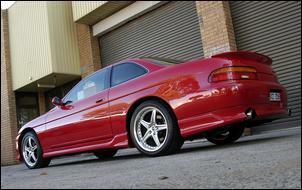 Peter purchased this Soarer in 2004 from a highly reputable vehicle importer – Sports and Luxury Cars (aka Cross-Over Car Conversions) in Melbourne . 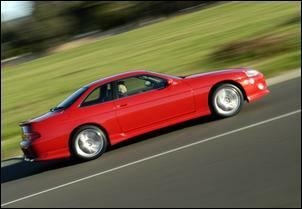 Peter had already owned a lesser-spec V8 Soarer and loved it so much he had to buy the top-line version – the UZZ32 Limited, complete with hydraulic active suspension, television and reversing camera. Interestingly, the top-line Soarer comes standard with the 1UZ-FE 4.0 litre quad-cam V8 – the 2.5 litre turbo (and entry-level 3.0 litre) was not available on this crème de la crème model. Despite presenting almost as-new, Peter took the car straight to a local body shop to have the original green paint stripped off, an Explosion body kit installed (which includes a later-model grille) and a fresh coat of paint. 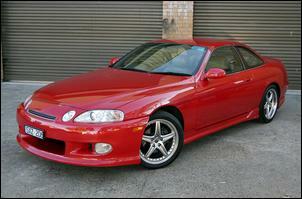 The colour is Mazda RX-8 Velocity Red pearl, which helps lift the Soarer’s bulky proportions. From there, the car returned to Sports and Luxury Cars for a full suspension rebuild. Peter says after around 100,000km and almost 15 years, it was only logical that the suspension could do with a revamp. 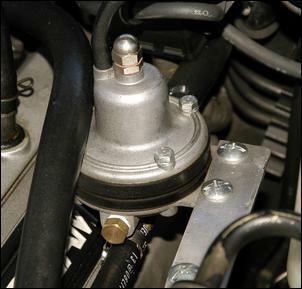 Low compliance Vlamos bushes were include in the rebuild – these improve handling response. But what about the performance of the standard V8? This wasn’t about to go unaltered. Peter sent the car to Sydney where it was received by Neil Griffiths of Rush Imports. Rush Imports has a strong following in Soarer circles, largely thanks to their in-house developed supercharger kits for the 1UZ-FE. The kit is built around an Eaton M90 supercharger and comprises a cast replacement intake manifold, an elbow (to mount the throttle body at the rear of the blower), all necessary brackets, tensioners and pulleys. Neil from Rush Imports says the standard kit is kept to just 6 psi boost. This avoids the requirement for an intercooler (which is difficult to squeeze under the lid of a Soarer) and the standard management system can cope without any mapping changes. All that’s needed is a Malpassi fuel pressure regulator. With this, Neil says the standard injectors operate well below 100 percent duty cycle. In addition to the supercharger kit, Peter opted for a set of Rush 4>2>1 headers and a custom twin 2½ inch stainless system with made-to-order mufflers. No point in having a strangled exhaust. 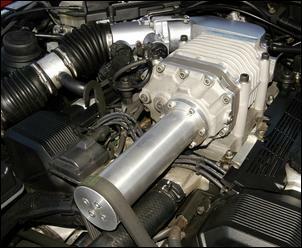 While the base supercharger kit uses the standard engine management, Peter saw the potential to improve power and drivability with a custom tune. To alter the mixtures and ignition timing, Peter employs a pair of Perfect Power SMT6 interceptors. We’re told that the Soarer runs a sophisticated ignition system that meant a single interceptor was not enough – two units were required. With 6 psi boost, a free-flow exhaust and altered engine management, Peter’s Soarer has achieved an impressive 48 percent power increase. In standard form, the car generated 134kW at the wheels but these days it cranks out 194kW at the wheels. Torque has also shot through the roof with a 63 percent peak gain! Peter has had no problem with the standard 4-speed automatic transmission but is currently looking at swapping to a Supra manual gearbox. This should provide further improved performance and neck-snapping throttle response. 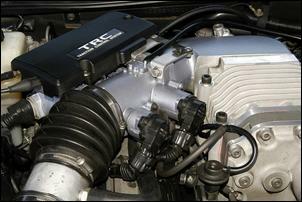 The rear-end has already been enhanced with a TRD clutch-type LSD. The soft, inviting leather trim is so cosy we can’t imagine why you’d want to ‘rough it’ it in anything else. 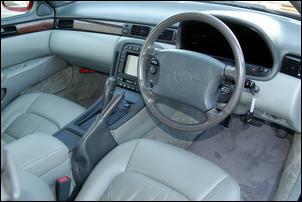 Standard Soarer UZZ32 features include a digital instrument cluster and full-function central display (with calendar, comprehensive trip computer, television and a monitor for the reversing camera). Peter has modified the central display so he can receive local radio and television and most of the on-screen characters are now shown in English (rather than Japanese). A DVD player has also been added to the factory sub-woofer sound system. Completing the package are HID low beam headlights and classy ROH Modena wheels (which are custom built with the required offset). The fronts measure 18 x 8 while the rears are 18 x 10s. Tyres are 245/45 18 and 285/30 18 Michelins. 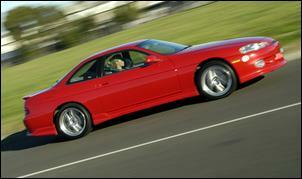 Peter – who has pedalled a BMW M3 and high-end X5 – says his modified Soarer is the nicest car he’s ever owned. And that’s b-i-g praise for a car that’s almost 15 years old! “It’s so comfortable and smooth and, with the supercharger, it has great torque at all revs,” he says. Still, Peter plans to take the engine to The Next Level. With a craving for more boost pressure, he’s considering rebuilding the engine with bigger cams and modified heads (with work on the combustion chambers to reduce the static compression ratio). 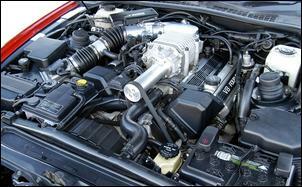 Bring on the boosted V8 beef!